Well, I finally got it done. 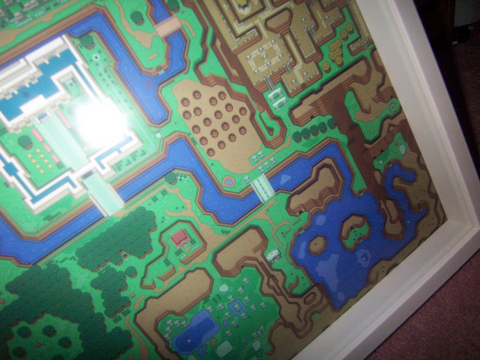 I decided to follow along with UncleBob's idea of getting a map printed and so I got printed the first map of VGMaps.com, The Legend Of Zelda: A Link To The Past's Light World! It's 50 cm x 50 cm. I chose this basic white Ribba frame from IKEA, 'cause just in case I do decide to print Alex Foster's Dark World map, I can get a matching frame that's black for it, and then put them next to each other or maybe on opposite sides of the same room. *whistle* The final thing looks gorgeous now, doesn't it? Some years back I remember Edge magazine (or was it their Retro special?) printed a 2-page spread that was a sizeable chunk of the Light World with a tiny credit in the corner. The reason I mention this: you can't appreciate how cool maps look printed until you see them close up. It somehow reinforces the "art-ness" of it compared to looking at it on a computer screen. Wileee, I can only imagine how large your Super Metroid map would have to be to still be able to make out the little details. 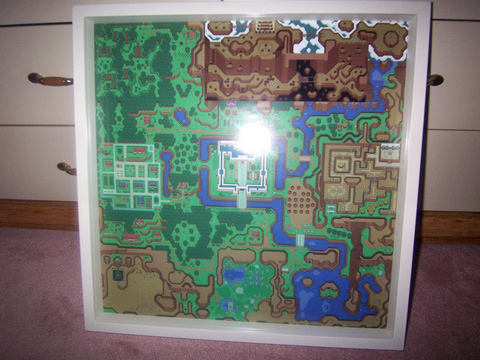 It would not look as good or as colorful as the Zelda map, but it would be neater to me. SJ: Do you ever find yourself printing out certain maps and, and making it into a big poster to put on your wall or anything? JL: I've been tempted to print out my Light World for A Link To The Past, and it seems like a lot of people have expressed interest in a poster like that, but of course, you know, obviously, I don't have the rights to all these graphics, but it would be really cool to have a wall-sized poster of that. "Hi, honey! Um, look what I did to the wall." I don't think that would go over well. SJ: (laughter) "Come on! It's Castlevania!" "Whatever, you're sleeping on the sofa." Your ad could be here - contact me for advertising inquiries. VGMaps.com is an archive of video game maps up since May 6, 2002. Optimized for at least 800 x 600 resolution. This site does not contain commercial ROMs or any other illegal materials. All directly "ripped" game images are the property of their respective copyright holders. This web site and compass logo are copyrighted by Jonathan Leung 2002-2019.